The smallest Audi was already a pretty polished performer. Now Ingolstadt gives the A1 a further spritzing. Jonathan Crouch reports. The Audi A1 has been given a modest working over, with a facelift, some different trims for the interior and more equipment. There's additional focus on boosting fuel economy and lowering emissions, while the smartest supermini on the block also ditches the old entry-level 1.2-litre petrol engine in favour of a more efficient 1.0-litre three-cylinder unit. It's still the go-to choice if you want small but don't like cheap. 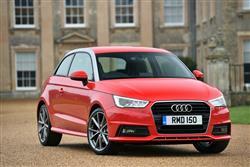 Audi's A1 was one of those rare cars that just felt instantly right when it launched in 2010. There weren't too many surprises with it, buyers knowing that here was a car that ran on much the same chassis as a Volkswagen Polo but features that reassuringly burnished Audi build integrity. Realising that just because buyers wanted small cars didn't mean they couldn't afford larger ones, the A1 wasn't cheap but the counterpoint to this was that it never felt like Audi were selling out and chasing a market they didn't have any right to be in. But that was 2010 and time moves very quickly in this corner of the market. In that period, BMW's MINI has completely reinvented its range and come at the A1 with some serious products. Audi's response has been measured. More of the same, with fine tuning across the board and the introduction of some typically intriguing engineering. It's not like Audi to be a follower but they've jumped on the one-litre three-cylinder petrol engine bandwagon, their triple developing a punchy 95PS, which replaces the unexciting 89PS 1.2-litre TFSI that used to prop up the range. Otherwise, you get to choose from two versions of the turbocharged 1.4-litre TFSI - the 'standard' unit with power up from 122PS to 125PS and the 'Cylinder-on-Demand' alternative now offering 150PS. Diesel customers are served by a 1.6-litre TDI. Depending on version, all engines will be linked to either a five-speed or six-speed manual transmission as standard, and for the first time all, including the 1.6 TDI, will also be available with the option of a seven-speed S tronic twin-clutch automatic transmission. Audi has upgraded the steering in the latest A1, the electromechanical system delivering a more faithful level of speed-sensitive assistance. Both the steering and the optional suspension with adjustable damping are controllable via the Audi drive select adaptive dynamics system, which is now a standard feature for A1 Sport models upwards. It allows the driver to vary the weighting or the damping characteristics across three modes - auto, dynamic and efficiency - and it can also adjust the operating parameters of the engine and the S tronic transmission, where this is fitted. There's also a new suspension option including adjustable dampers available for Sport models and above. At the top of the range sits the ballistic 231PS S1 quattro, which will dust off the sprint to 62mph in just 5.8 seconds. The A1's styling hasn't changed markedly, but you might well spot the flatter and wider singleframe grille, revised bumpers, different standard alloy wheel designs and an updated colour palette. Otherwise, it's still a familiar shape with the arcing roofline that looks so good in contrast colours. The cabin adheres to typical contemporary Audi design language. If you've driven an A3 or an A4, you'll feel very much at home here, as indeed Audi has intended in order to attract customers looking to downsize. Unlike some rivals, the interior is quiet and maturely finished with no speedometers the size of dinner plates or garish graphics. Audi contend that if you're downsizing from a bigger car, you expect big car sophistication and the A1 serves that up in spades. Everything is soft touch, silicon damped and consistent in feel and design. There's now additional chrome and high gloss black detailing, new upholstery choices including an Alcantara and leather blend and new upholstery colours, such as Laser blue for Sport models and Rotor grey for S line models, which until now have had an exclusively black finish. The A1 body can only afford so much interior space in a package 3954mm long, but the 267-litre boot extends to a respectable 920-litres if you drop the back seats. It's a little bigger than most city cars but is aced for space by a lot of superminis. Prices haven't marched north by anything too significant, which means that you can pick up a 1.0-litre car from around the £14,500 mark, with the 1.6-litre diesel tacking another grand onto that. Trim levels run through SE, Sport and S line, and even the entry-level car gets alloy wheels, remote central locking, air conditioning, electric front windows and mirrors and a six-speaker single CD audio system with auxiliary iPod connection linked to a 6.5-inch retractable display. A secondary collision brake assist system also now joins this list for the latest range, which can initiate automatic braking to reduce the risks of skidding and additional collisions during an accident. The Sport models now include 'Audi drive select', as well as the Audi Music Interface and preparation for SD card-based navigation. These variants already featured upgrades such as larger 16-inch wheels, sports suspension, sports seats, Bluetooth mobile phone preparation and a Driver's Information System. Go for the S line and you can add xenon headlamps with LED daytime running lights and LED rear lights, further enhancing an additional specification which already included 17-inch alloy wheels, exclusive S line exterior styling and interior detailing, S line sports suspension and leather and cloth combination upholstery. There are also Tech and Comfort packs available if you're not already spent out. There's been a concerted drive to efficiency in this latest A1, and nowhere is that more clearly demonstrated than in the replacement of the 1.2 TFSI with the 1.0 TFSI engine. The newer three-pot engine is capable of returning at least 60mpg with CO2 emissions of 99g/km, which easily betters the old powerplant's 118g/km and 55mpg showing. The 1.4-litre TFSI petrol engines don't do too badly either, with the standard 125PS unit emitting 115g/km and that clever Cylinder-on-Demand technology shaving that number down to 112g/km, despite packing 150PS. The 1.6 TDI retains its place as the efficiency trailblazer in the range, with CO2 output in this latest version reduced from 99g/km to 92g/km and economy potential increased from 74.3mpg to up to 80.7mpg. The evolutionary styling of this mildly facelifted model isn't going to send residuals of older A1s swirling down the gurgler, which will come as some relief if you're an existing owner, and should help protect the value of your trade in if you fancied chopping it in against a new version. When we first drove the A1, we were a little underwhelmed. Perhaps we took the Audi build quality for granted, but there was little new ground broken. We wondered how it would fare but it seems we needn't have worried. Those people looking for the Audi of superminis found exactly what they were looking for in the pert shape of the A1 and over 500,000 have been sold. The script isn't going to change too dramatically moving forward. This A1 is a bit better looking, a bit nicer inside and a bit more efficient. Marginal gains, you might say, but they all serve to reinforce its position as something a little way removed from the supermini standard. Its commitment to efficiency and its class-leading residual values make it a smarter selection than many realise. View the Audi A1 as a Volkswagen Polo with tinsel and you've pretty much missed the point.